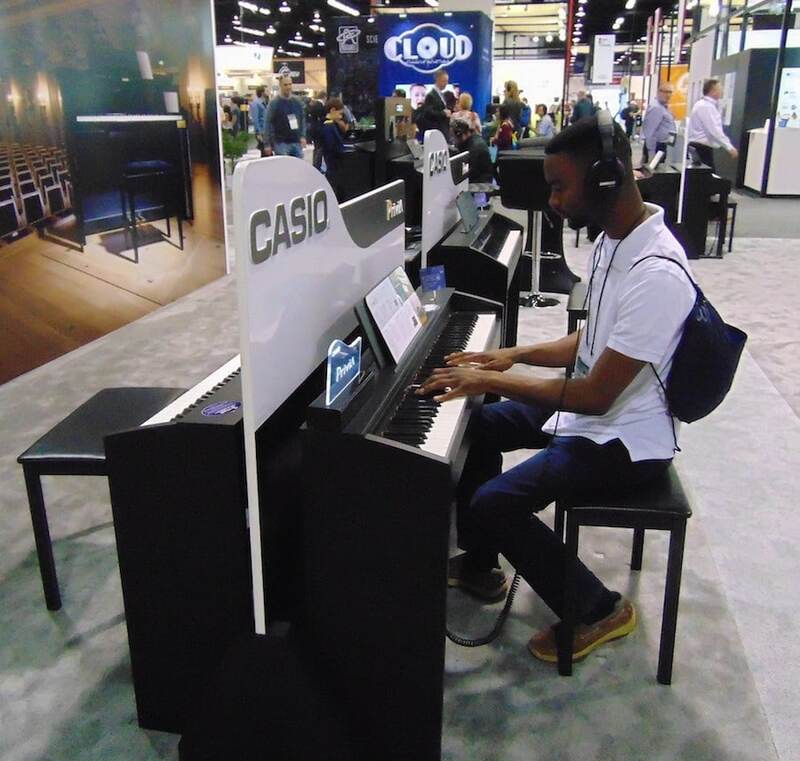 This year’s NAMM (National Association of Musical Merchants) convention in Anaheim, as usual, drew a crowd of tens of thousands of music store owners, instrument manufacturers, players and famous musicians from around the world. And there was no shortage of players who couldn’t wait to try out, and hear, the latest gear and technology. 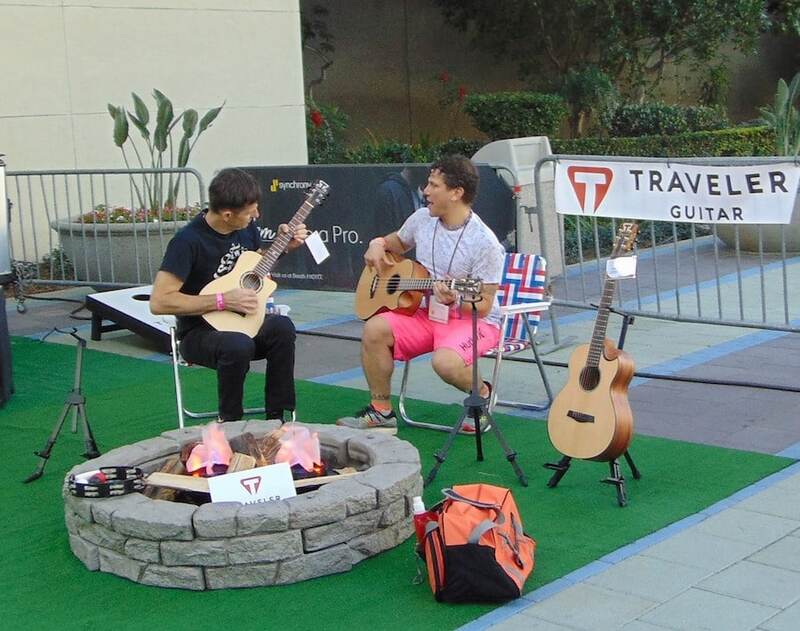 Here, bassist Brandon Blake, of German company Hokema Kalimbas, and Austin-based guitarist Nermin Osanovic, check out some gear from the Traveler Guitar company near the Anaheim Convention Center entrance. All photos by Rick Moore. 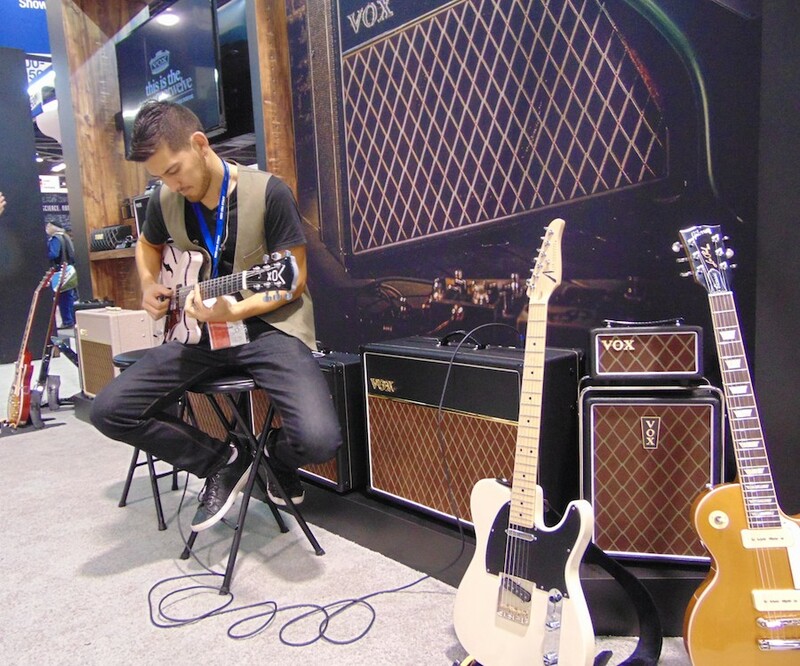 Guitarist Sean Beck plays a Vox guitar (yes, they make guitars too) at the booth of the legendary amplifier company. 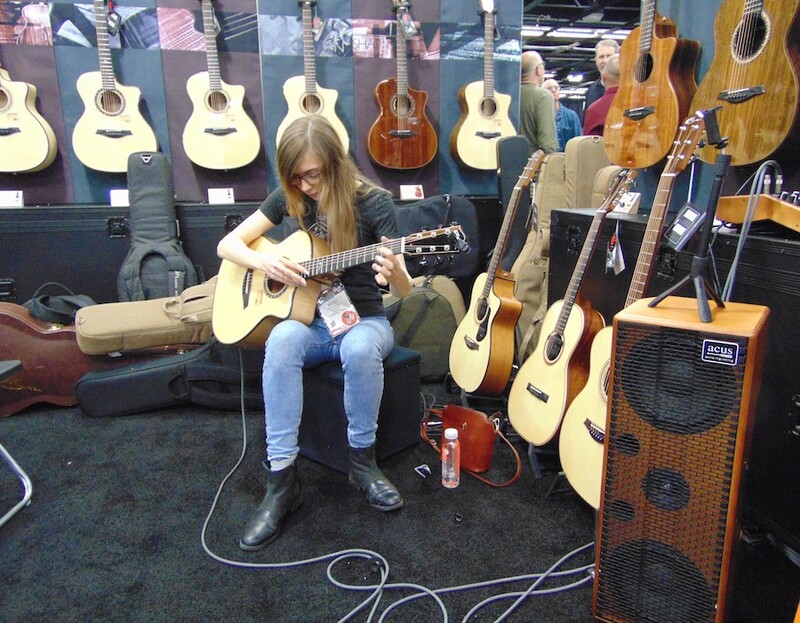 Sales Director Angela Wade of Collings Guitars shows her barre chord chops on one of the Texas-based company’s Parlor Deluxe Madagascar Adirondack Traditional models. 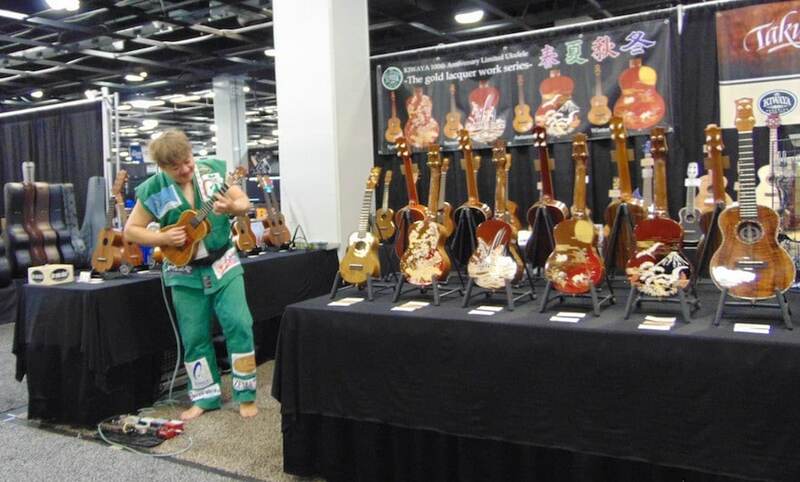 Renowned Japanese ukulele player JazzoomCafe performs at the Takumi Ukulele booth. 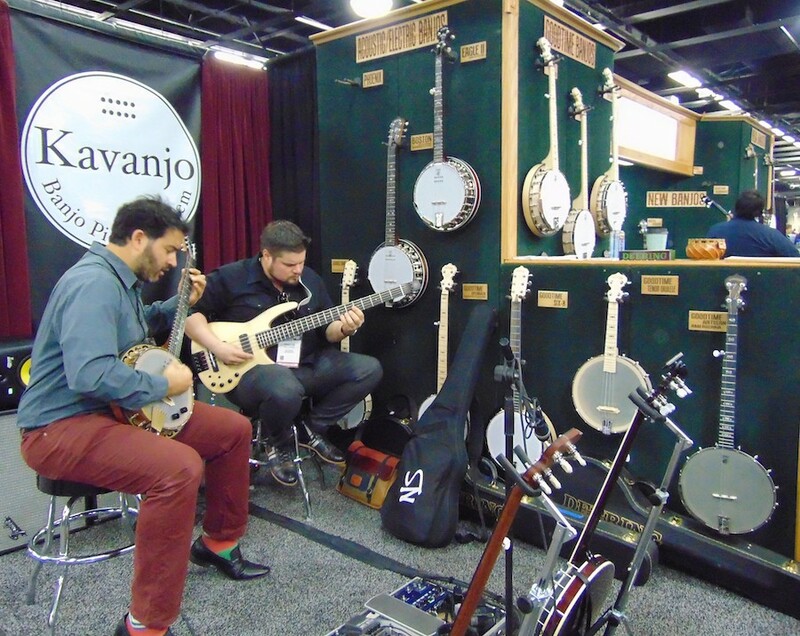 Six-string banjo player Lucas Cantor and bassist Marcos Varela demonstrate the sounds of the Kavanjo pickup system at the Deering Banjo Company booth. 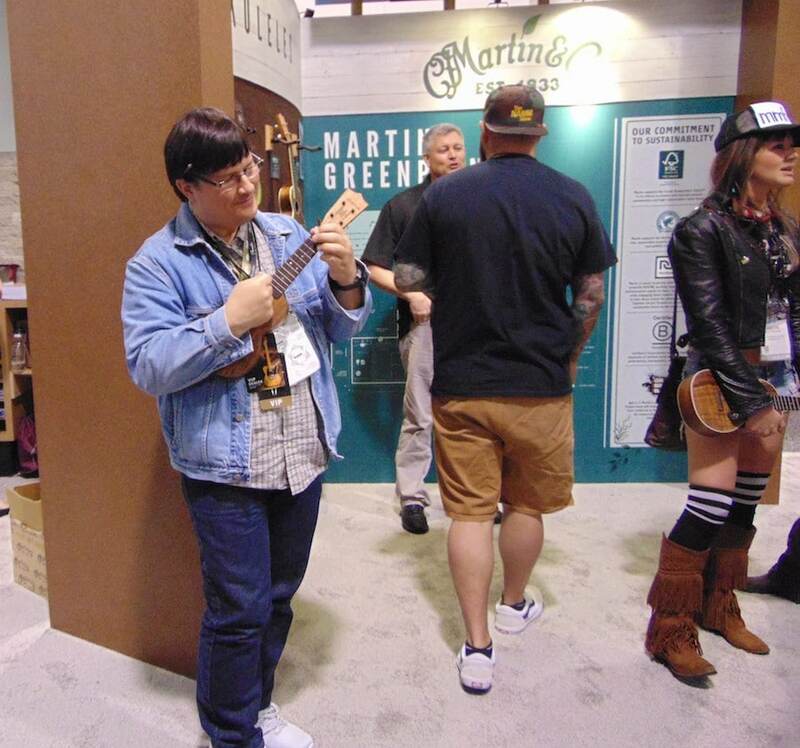 Eric Hesson of Fuller’s Guitar in Houston checks out one of the new ukulele offerings from the Martin company. 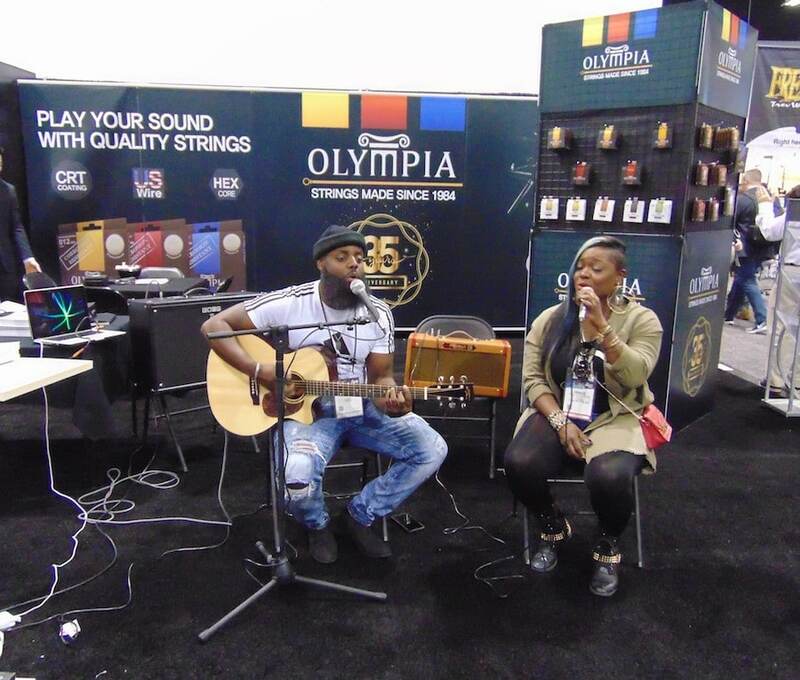 The members of Cleveland’s J. Penelope, guitarist James Penn (playing a Recording King guitar through a Boss amp) and singer Penny Hamilton, perform at the booth of Chinese string manufacturing company Olympia. 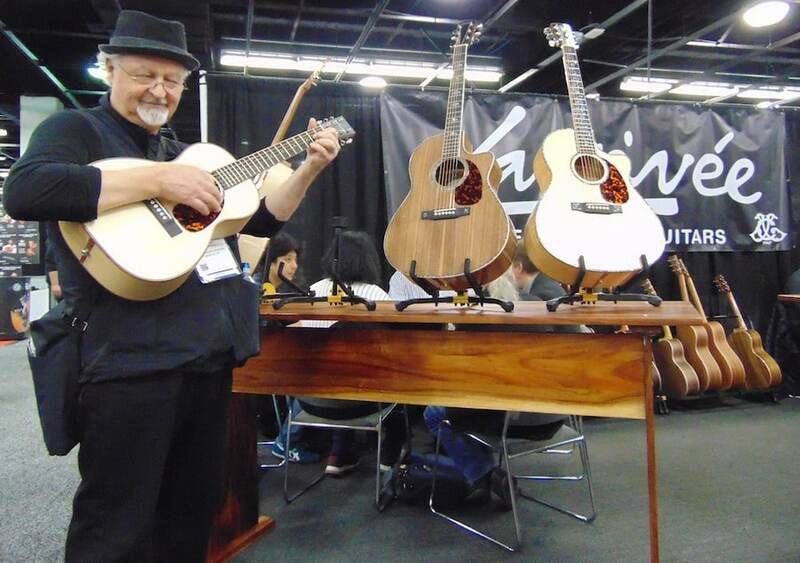 Guitar industry veteran Roger Cooper of The Fingerboard Extension in Corvallis, Oregon, tries out an aesthetically innovative Larrivee parlor guitar. 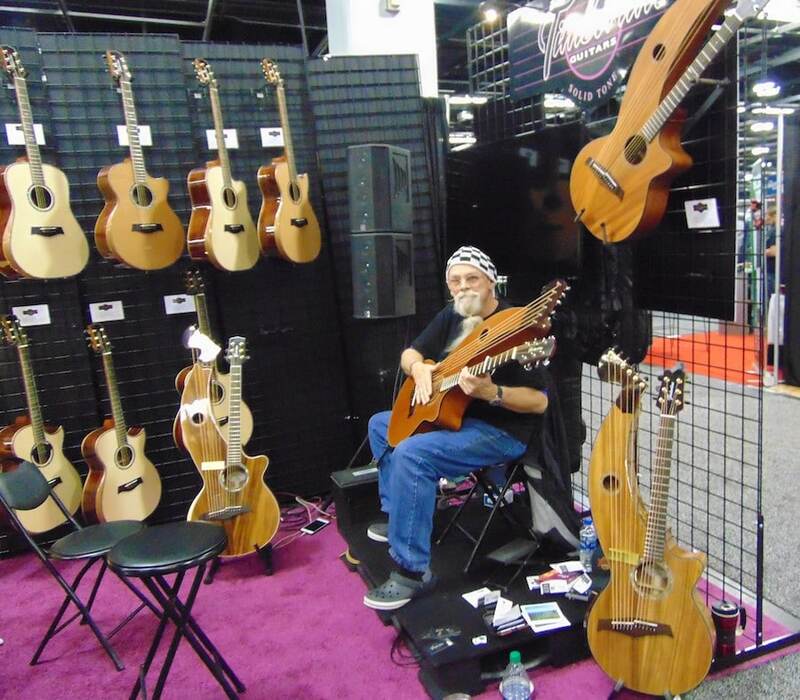 Timberline Guitars president Rob Smith demonstrates one of his company’s harp guitars. 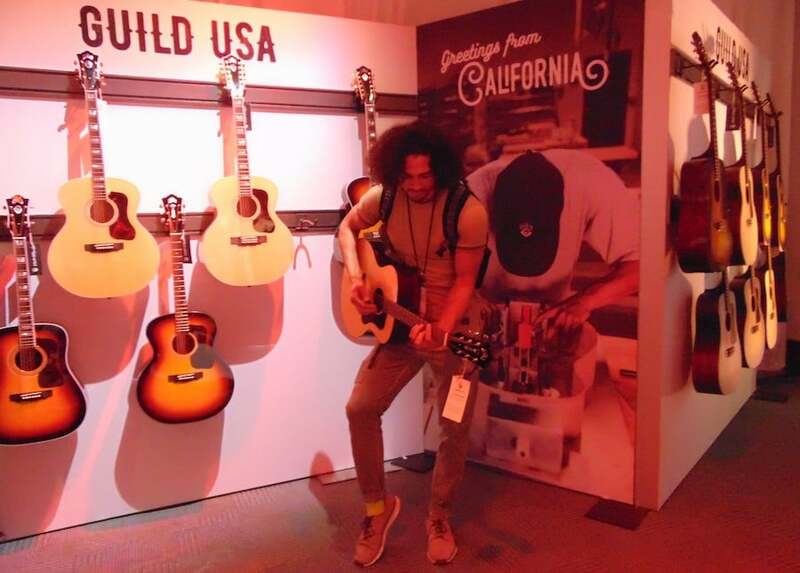 Virginia-based musician Blake Johnston, in town with Knoxville, Tennessee plug-in company Waves Inc., tries out a new axe from Guild USA. 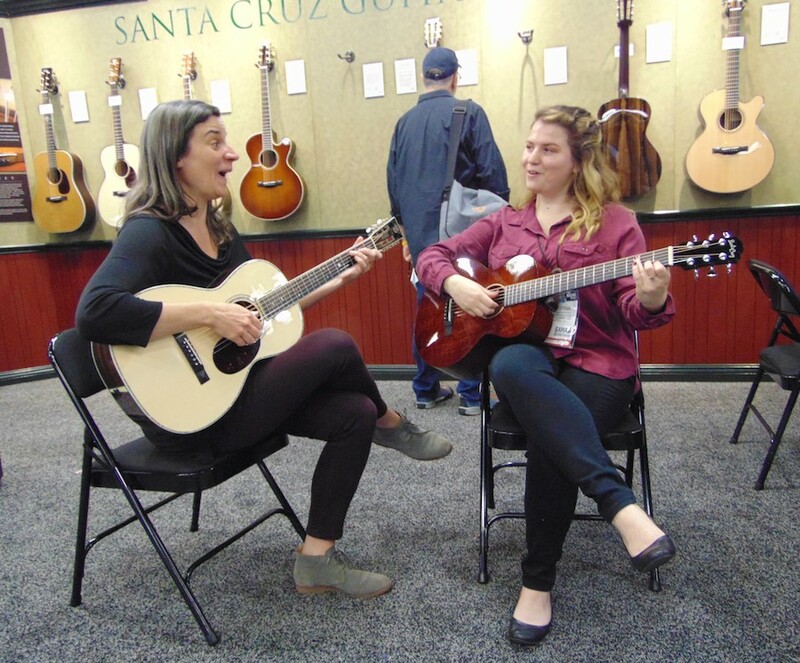 Jamie Stillway, left, and Christina Webster of Santa Cruz Guitars show their chops on a couple of the company’s instruments. 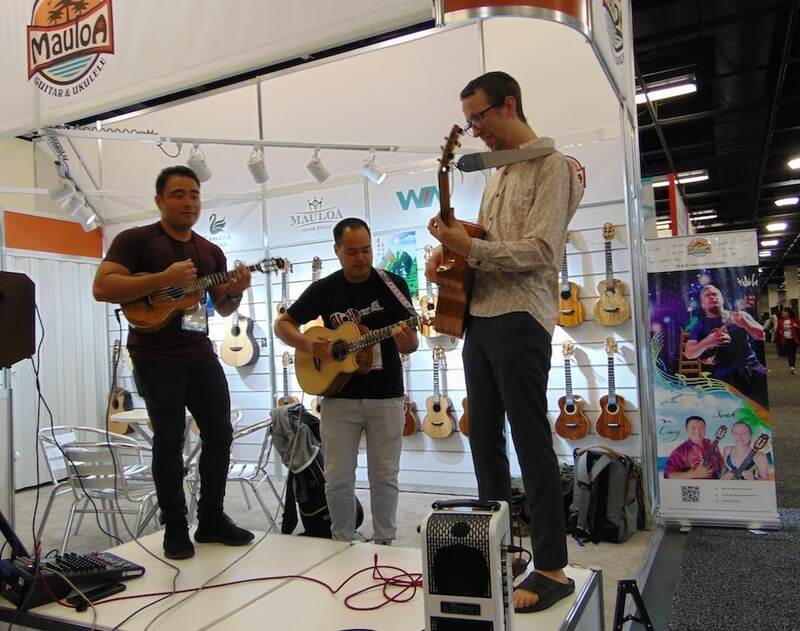 Ukulele player Kalei Gamiao, guitarist Corey Fujimoto and bassist Milo Fultz tear it up at the Mauloa Guitar and Ukulele booth. 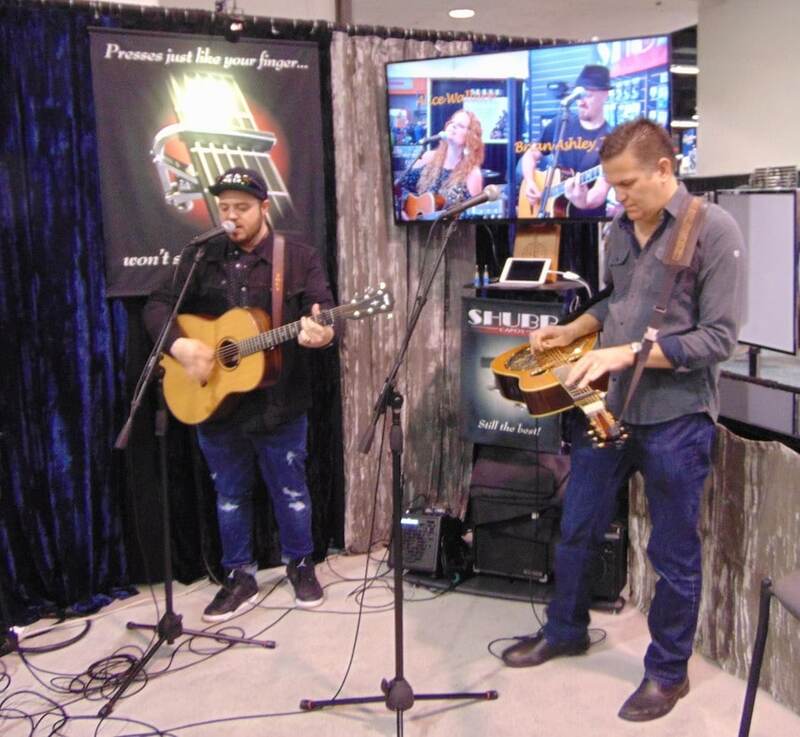 Bluegrass guitar favorite Trey Hensley, playing a Taylor, and Dobro/National legend Rob Ickes, show everybody how it’s done at the Shubb Capos booth. 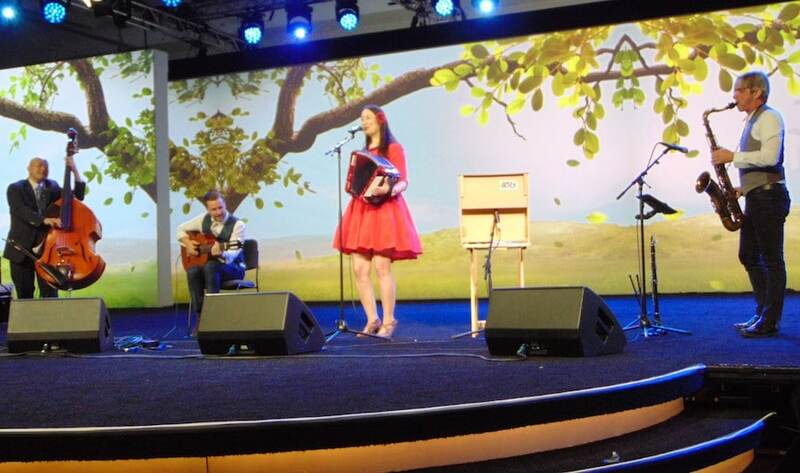 Jessica Fichot and her band perform her style of what her website calls a “multilingual fusion of French chanson, Shanghai jazz, gypsy swing and international folk” at the NAMM Saturday Breakfast Session. 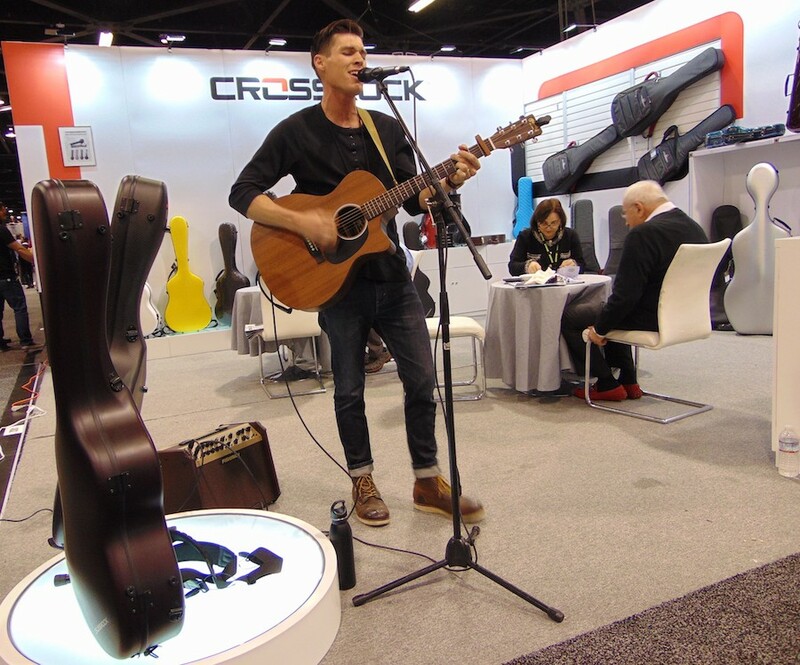 Singer/songwriter Stevie Morin of Los Angeles performs on a Martin guitar at the booth of instrument case manufacturer Crossrock. 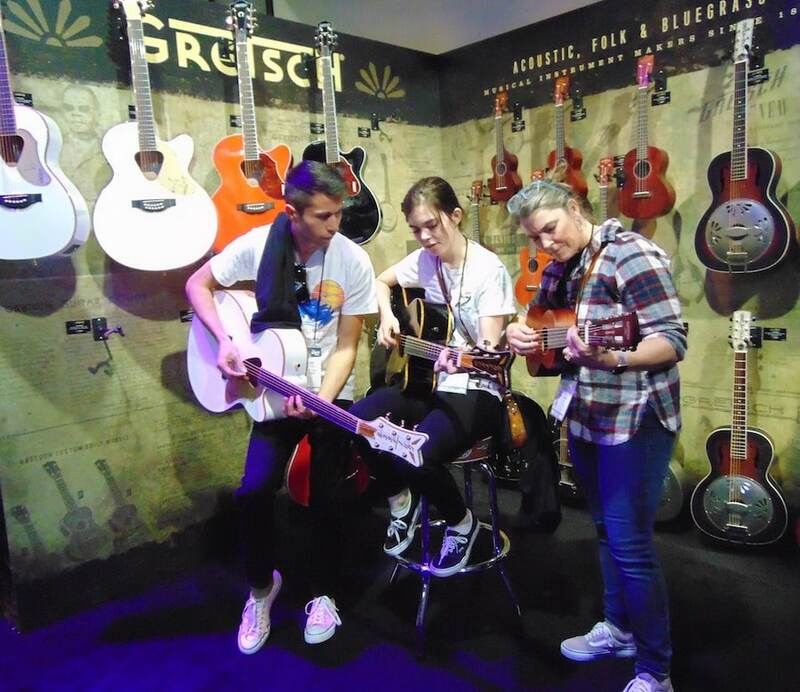 Aldrich Zurcher, Mattie Myers and Carolyn Myers of Ventura County, California try out some instruments in the Gretsch room. 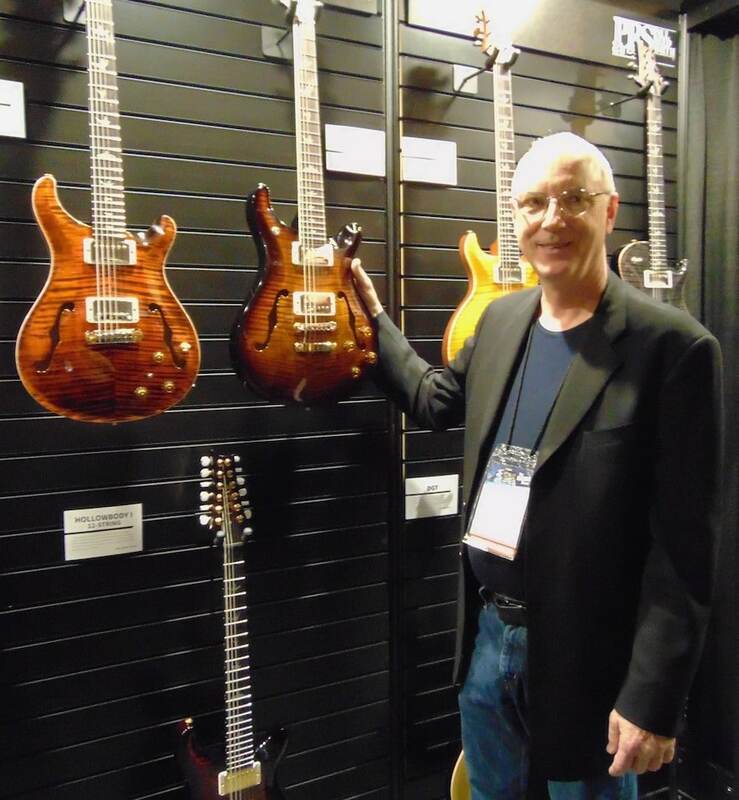 It’s not every year that the CEO and namesake of company attends NAMM, but Paul Reed Smith is the exception this year, in the spotlight with a couple new beautiful electric models. 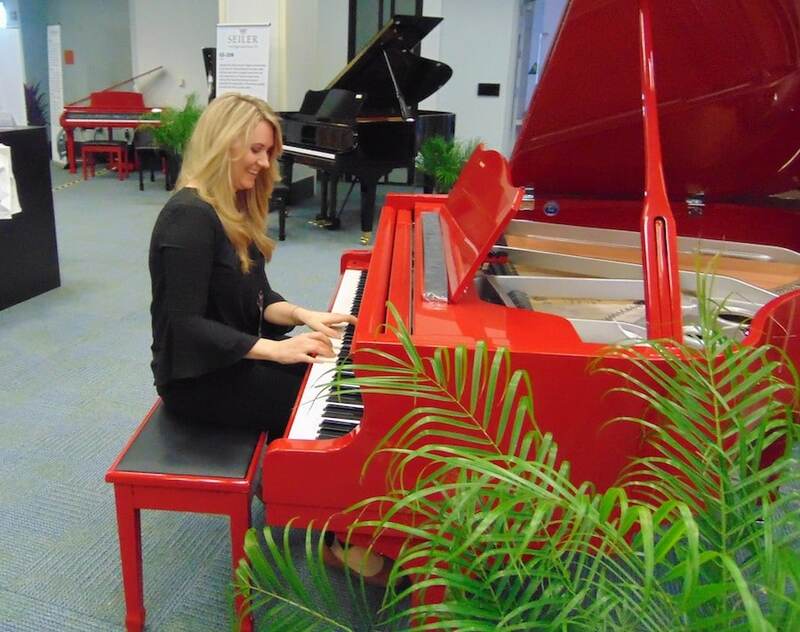 Anakacia Shifflet, with the Piano Marvel software company, plays a striking red MIDI-capable Seiler piano. 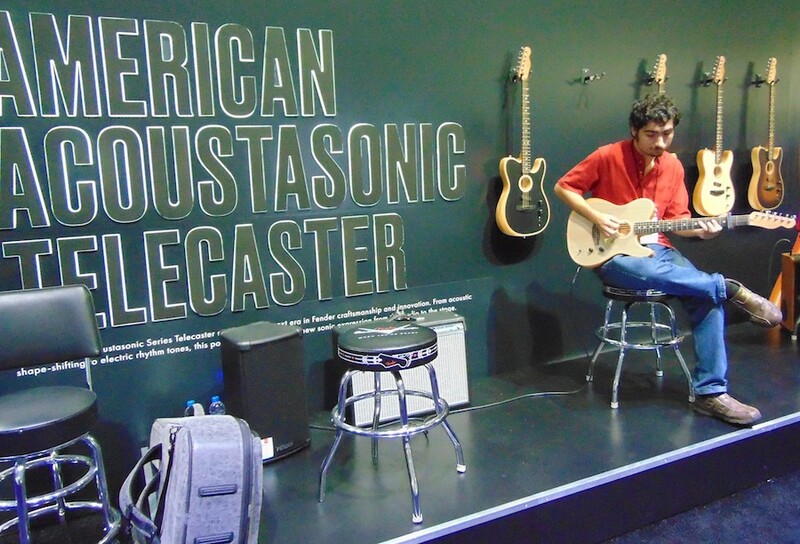 Floridian Daniel Zangenburg, professionally known as Danny V, tries out one of the new Telecasters from Fender’s Acoustisonic line. 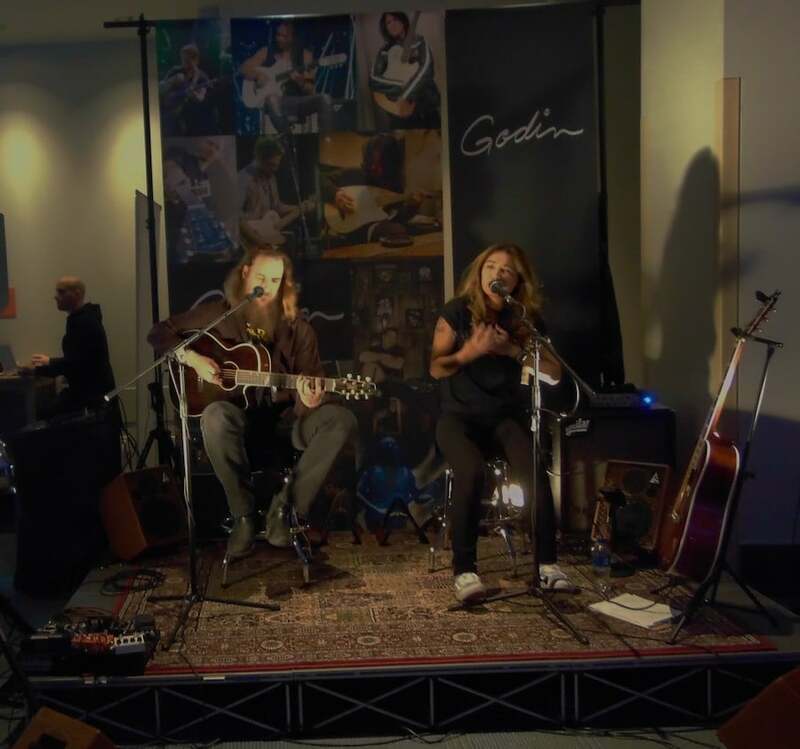 Guitarist Skunk Manhattan, of Austin, Texas, and Thai vocalist Suki Wangsomnuk draw a crowd in the room of Canada’s Godin Guitars. 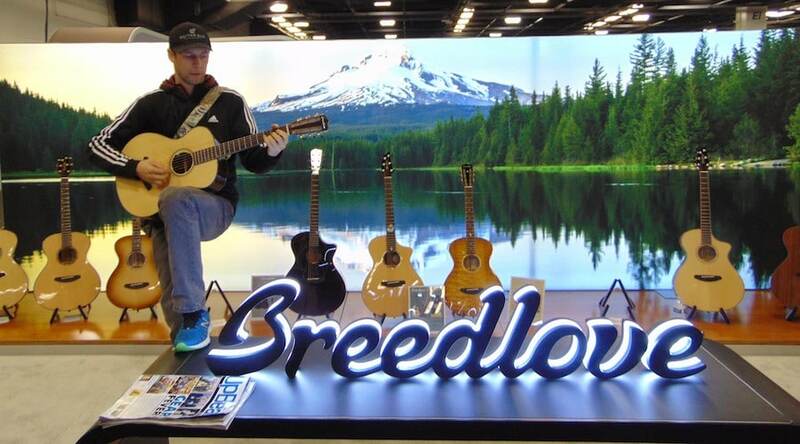 Cory Donnell of microphone company Musicland in Greenville, California, checks out a limited-edition Breedlove Concertina E.
College music major Bakari Hargett-Robinson of Pennsylvania plays a Privia PX-870 from Casio. 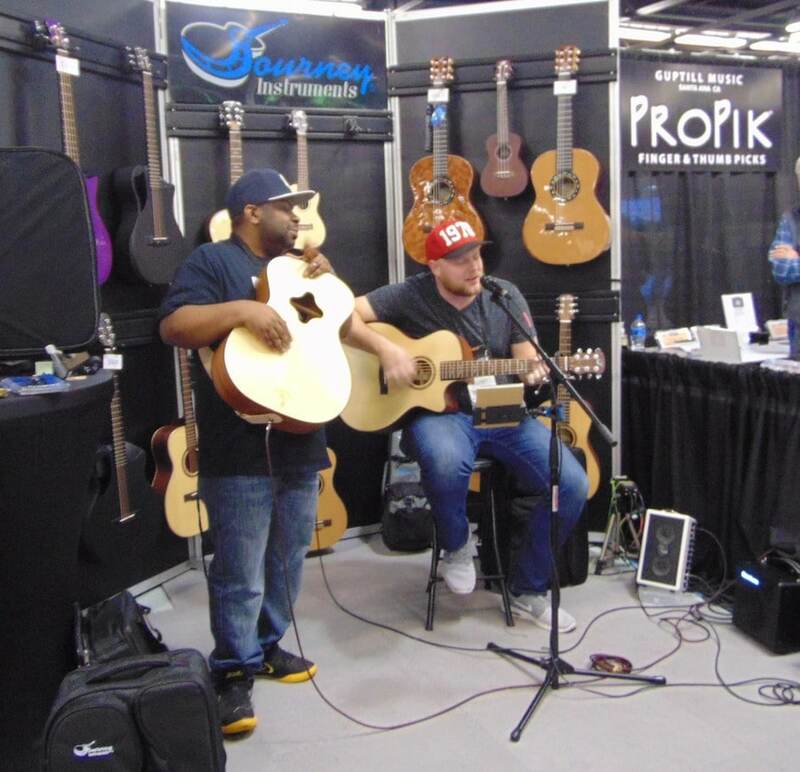 Johnnie Ballard plays the WalkaBout Drum with guitarist/vocalist IanJames at the booth of Journey Guitars. 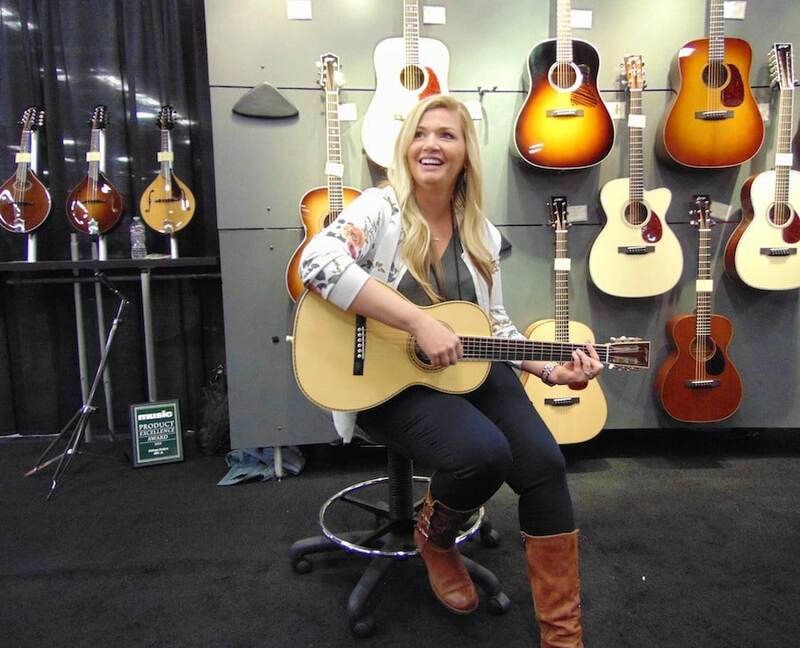 Innovative British fingerstylist Becky Langan demonstrates one of the guitars from the product line of Chinese instrument company Mayson. 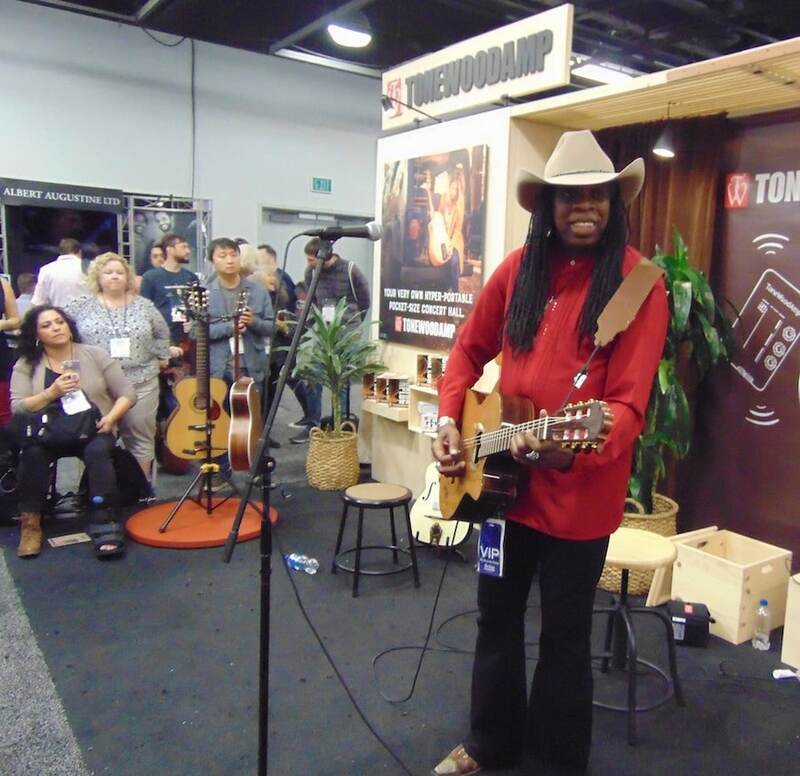 Guitarist Larry Mitchell demonstrates the acoustic guitar effects features of the ToneWoodAmp at the company’s booth. 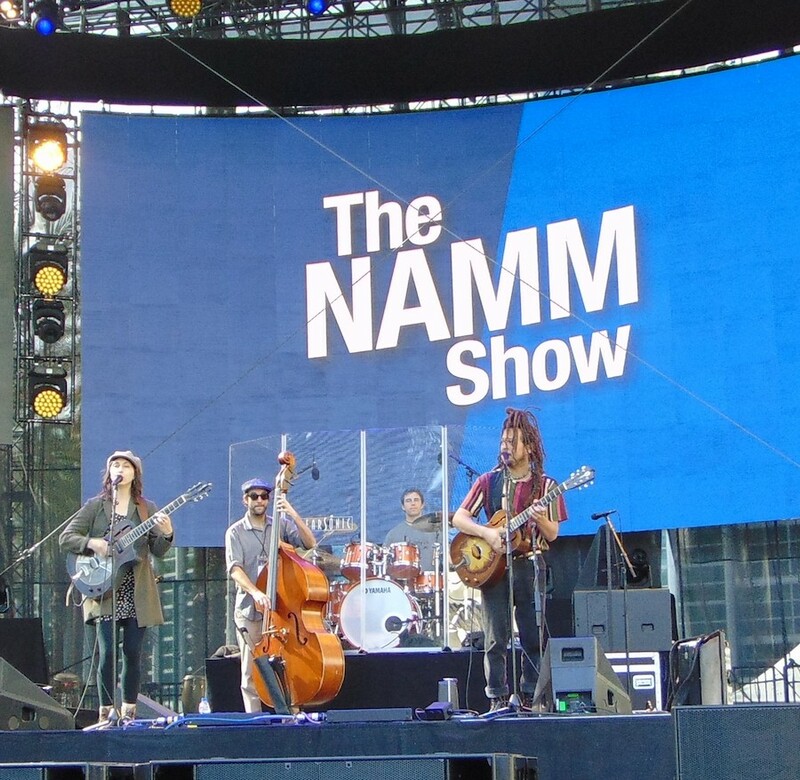 Eclectic San Diego duo Nathan and Jaimie and their band perform at one of the outdoor NAMM stages. 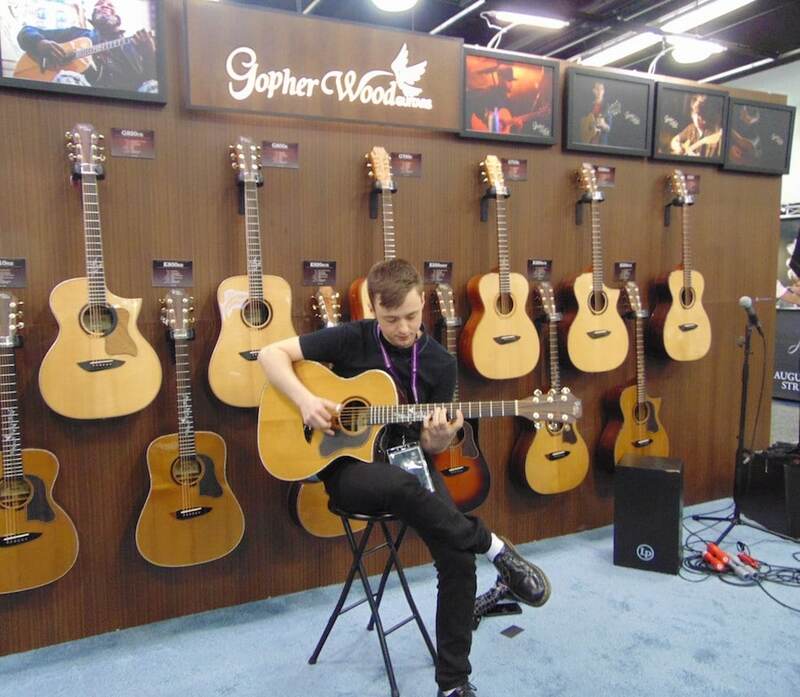 Guitarist Connor Thomas of the United Kingdom tries out one of the new guitars from the Gopher Wood company.